It’s curious why it should be so, but Sigmund Romberg’s “The Student Prince,” the third and final offering of Light Opera of New York’s season – theoretically, the simplest to stage after the far more elaborate demands of “Desert Song” and “The Vagabond King” – proved more problematic to pull off. Paradoxically, it may be because Dorothy Donnelly’s book – about a 19th century prince who falls in love with a Heidelberg barmaid before being called back to his duty - is so good, based as it is on a popular play of its day, that the acting really needs to be grippingly compelling, while the endless reprises of the big tunes and extensive use of underscoring demand a full orchestra for maximum effectiveness. Daniel Greenwood and Elizabeth Hillebrand proved likable performers with quality voices. His phrasing had elegance and style, though like so many of the cast, he wasn’t always successful in cutting through the tubby acoustics of the Landmark on the Park church. Hillebrand’s notes sailed out in the high lying passages, but at some loss of vocal purity. Their acting was better than adequate, though he could have used more dash, she more charm. Scott Michael Morales did an OK job with the comic shenanigans of Lutz, the prince’s stuck-up valet, and ditto Jeff Horst as his sidekick Hubert, but their dated comic business quickly grew tiresome. Musical director Steve Vasta’s reduction of the orchestrations was tasteful as always, and the result seemed more of a chamber piece than his more vigorous previous efforts. There were some cuts in the score, but it was nice to hear many of the bits and pieces of the score less frequently recorded. Intimate though the story is, “The Student Prince” calls for a robust male chorus. Even though “Vagabond King” and “Desert Song” contain far more muscular singing, LOONY somehow overcame the limitations of its small casts in those productions, but the crew here sounded pretty anemic, starting with their clomping onstage for their entrance, or pounding their beer steins on the table during “Drink, Drink, Drink.” The famous “Serenade” was executed with some sensitivity, but was not the knockout it should be. Angela Christine Smith made an imposing Grand Duchess, mother of the prince’s betrothed, Margaret (Jennifer Dorre). The acting demands on the latter are minimal, but she sang the second act duet “Just We Two” nicely with Christian Smythe as her admirer Captain Tarnitz. Matthew Kreger as Detlef, the principal student and head of the Saxon Corps into which Karl Franz is happily recruited, sang his several bits with firm tone and appropriate robustness. David Macaluso and Matthew Hughes also scored as students who have important parts in Romberg’s intricate ensembles. On this occasion, resident book adapter Alyce Mott seems to have employed a light hand, given the superior source material, though she might have chopped a bit more in this instance! The book-heavy second act, with its long stretches of dialogue and paucity of new songs, was especially deadly. Lydia Gladstone’s costumes added pleasing visual interest as usual. But the green curtains that masked the altar area became monotonous over such a long evening. 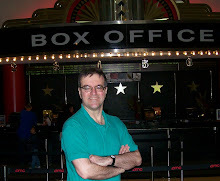 Resourceful director Gary Slavin did his best with the limited resources at hand. Though, of course, there was no amplification when “The Student Prince” was first performed in 1924, miking would have helped this performance immeasurably. The dialogue would have been far more involving, and the balance between the singers and orchestra rectified. If LOONY ventures into less familiar territory in coming seasons -- and the attractive “operetta guide” insert in the program suggested this might be so – full audibility will be essential. For all its faults, the audience – old-timers, operetta lovers, and showbiz pros alike – seemed to enjoy the tunes and the sentimental story. The evening didn’t end with a standing ovation, but it began with one as board president Norm Keller paid touching tribute to co-founder Jack Behonek who died suddenly in April following surgery. The enormous success of “My Fair Lady” (“Pygmalion”) and “The Chocolate Soldier” (“Arms and the Man”) notwithstanding, most of George Bernard Shaw’s works -- including his 1897 “Candida” from which the dully titled “A Minister’s Wife” derives -- would seem highly unlikely candidates for musical treatment, despite "Candida" containing rather more romantic elements than some others of his plays. 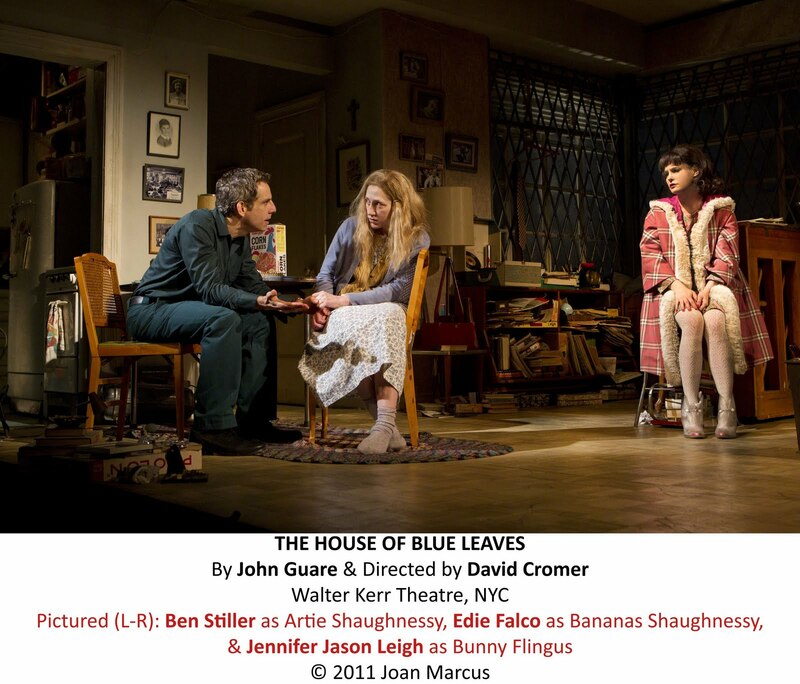 But Michael Halberstam – who both conceived and directed this production – apparently thought otherwise. With a score by Joshua Schmidt, whose adaptation of Elmer Rice’s “The Adding Machine,” was so compelling, and lyrics by Jan Levy Tranen, and a reduction of Shaw’s original by Austin Pendleton, the result is well-intentioned but tedious, even at 95 minutes. This is not to say the leading players aren’t commendable. Marc Kudisch is The Reverend Morell, a Christian Socialist, high in demand on the lecture circuit. 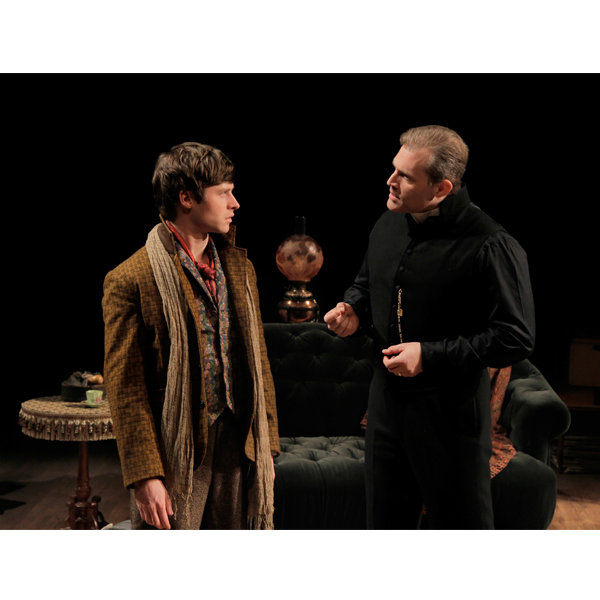 Kate Fry is his lovely, empathetic wife Candida, just returned from holiday with an idealistic young poet Eugene Marchbanks (played by Bobby Steggert) in tow. In short order, Marchbanks, who is totally smitten with Candida, declares his love for her, and his belief that she is wasting her life with the commonplace Morell who bores his wife with what Marchbanks defines as merely “the gift of the gab.” Though Morell is tempted to throw the lad out, he begins to think perhaps the young man’s accusation might carry some truth, and he allows him to stay, ultimately forcing Candida to choose which she prefers. Drew Gehling is Morell’s curate Lexy, and Liz Baltes his adoring secretary. Pendleton has dispensed altogether with the colorful and humorous character of Candida’s low-born father who, in the play, engages with Morell in a Higgins-Doolittle sort of dynamic. Though it’s unfair to judge a score on first hearing, the songs – such as they are – seem utterly extraneous, an intrusion on Shaw’s brilliant original. They’re accompanied by an orchestra of four players, giving the enterprise the feel of a chamber musical. Shaw’s play – a comic and wry paean to marriage and a “counterblast” (to quote Shaw) to Ibsen’s “A Doll’s House” (for here, it is the husband who is essentially the “doll”), -- was always one of his most popular. But you’d never know it from this dreary retread. Despite the talent gathered here, Allen Moyer’s attractive setting, David Zinn’s period costumes, and Keith Parham’s sensitive lighting, I'll take my "Candida" straight, thank you very much. 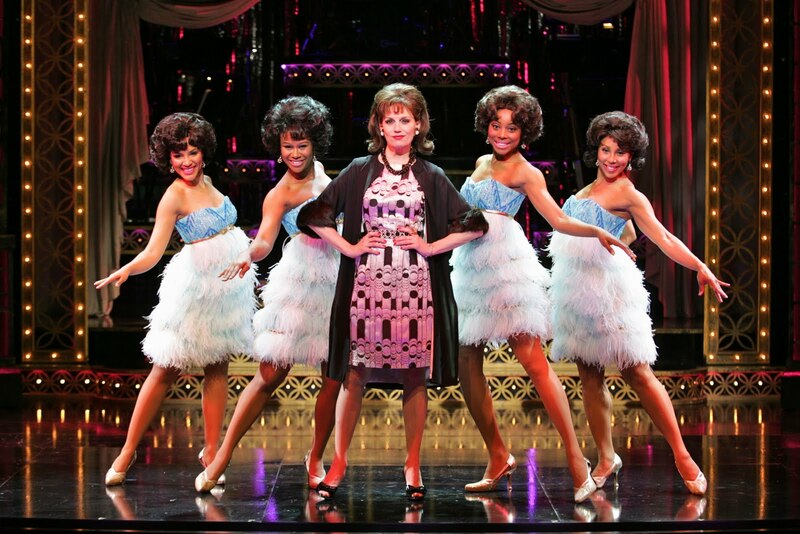 “Baby It’s You!” tells the story of Florence Greenberg (Beth Leavel), a music-loving Passaic, New Jersey housewife and mother of two, who founded and promoted the Shirelles. The four African-American high school girls would become the country’s number one female singing group. The narrative unfolds in a mostly enjoyable if unabashedly superficial way. Floyd Mutrux and Colin Escott’s script (conceived by Mutrux) also charts the breakup of her marriage to her male chauvinist husband Bernie (Barry Pearl), and affair with African-American songwriter Luther (“Sixteen Candles”) Dixon (Allan Louis) who became her business partner in Flo’s record company Scepter which went on to release Burt Bacharach’s early output. Ultimately, her determination to bring that composer into the fold would cause a rift with Dixon. The show comes across as a lightweight mash-up of “Jersey Boys,” “Memphis,” and any number jukebox musicals, but within its less ambitious structure, what it does, it does very well. Along with the Shirelles hits like “Soldier Boy,” “Will You Love Me Tomorrow,” and “Mama Said,” are numerous other pop songs of the period. showing the group appearing on bills with name performers, like Chuck Jackson (“Since I Don’t Have You”), Lesley Gore (“It’s My Party”), and Dionne Warwick (“Walk on By”). This serves to add variety to a generally satisfying musical program. Plot-wise, the focus is squarely on Greenberg, with the Shirelles – Shirley (Christina Sajous), Beverly (Kyra Da Costa), Doris (Crystal Starr), and Micki (Erica Ash) -- providing mostly the onstage and in-studio vocals. We see Flo’s maternal concern for her girls, and eventually Shirley seems to be a rival for Dixon’s affections, adding a teasingly triangular aspect to the plot. Not much is made of that, however. Still, the general arc of the story is interesting enough. Leavel gets her meatiest role yet as the savvy, determined entrepreneur, and she’s quite good, script sketchiness notwithstanding. Louis makes a solid Dixon. The first act plays very well, charting as it does Flo’s improbable career switch and the ascendancy of the group. The second act, though packed with songs, has a more sour edge, dealing as it does with the group’s loss of popularity, and the breakup of Flo and Dixon. Of course, their adulterous affair has a somewhat disagreeable patina to begin with. But it’s clear he financed his wife’s early efforts. At one point, Flo says to her daughter Mary Jane (Kelli Barrett) from whom she’s estranged, “You know your father,” perhaps hinting at other character flaws, but we never get to hear them. Similarly, an implication of payola is glossed over. At the end of the day, though, I think Mutrux and Escott were wise not to delve too much into the nitty-gritty, but tell just enough of what really happened to support the songs. Apart from Leavel, Louis, Sajous, and a couple of others, the cast members play multiple roles quite impressively. Geno Henderson as the show’s narrator Jocko essays three other parts; Brandon Uranowitz plays both Flo’s blind son Stanley and promoter Murray Schwartz, and Barrett (who has a terrific voice, incidentally) has a turn as Lesley Gore. The characters are fairly one-dimensional, but the story is told well enough, and it is compelling. The songs are pleasingly performed, some of them sung in character beginning with a script cue and, and then opening up to a full-bodied number done by the girls or one of the other contemporary singers. The musical program overall is first rate, and uncommonly well integrated into the plot. The show is nicely paced by Mutrux and Sheldon Epps who share directing credit, This is a relatively compact production, but it looks handsome enough, thanks to sets by Anna Louizos, costumes by Lizz Wolf, and lighting by Howell Binkley. If you aren’t bothered by the lack of depth, you should have a good time. 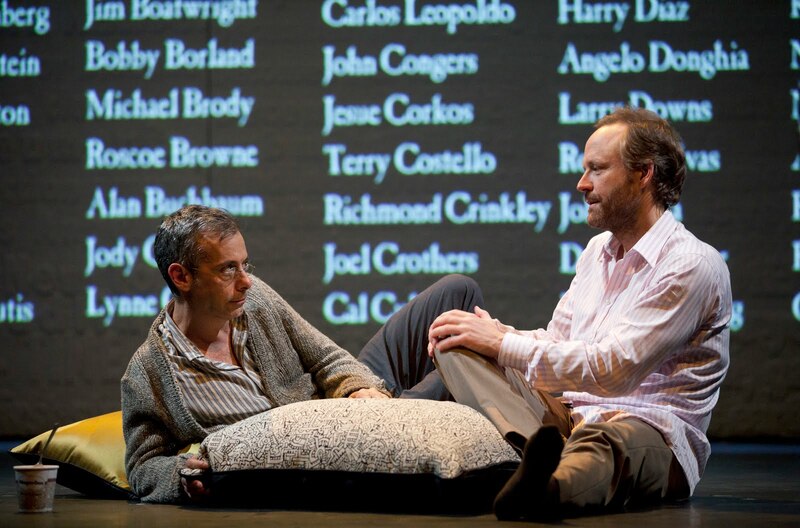 The excellent 2004 Public Theater revival (with Raul Esparza) of Larry Kramer’s masterwork about the early days of the AIDS epidemic – 1981-84, to be exact – was not that long ago. But this spellbinding revival with its superb cast more than justifies its mounting on Broadway a mere eight years later. Jointly directed by the Joel Grey (who played Ned during the play’s original run) in tandem with George C. Wolfe, the action plays out on David Rockwell’s spare white box set, which allows projections of the time and place, and most strikingly and poignantly, the ever-growing lists of AIDS victims. On this occasion, it’s Joe Mantello who plays the Larry Kramer role of Ned Weeks, a writer who becomes a strident activist fighting an unyielding bureaucracy, and he plays it brilliantly, not afraid to show Ned’s irritating side when he needs to do so, which is often. Of course, Kramer is the hero of his own drama, but he shows enough of the abrasive quality to offset the halo. Though much has transpired since the events outlined here, the plague (as Kramer labels AIDS in a heartfelt letter handed out after the show) still has no cure, research for a cure is shockingly under-funded, and people are still dying. Even if that weren’t the case, the events of the play are as irresistibly gripping as in an Ibsen play. Good as Mantello is, the rest of the cast is equally fine. John Benjamin Hickey plays Felix Turner, the New York Times Style-section writer, whom Ned approaches with the hope the paper will finally write about the epidemic, but in short order, they fall in love. Their happiness is short-lived when Felix discovers a lesion on his foot. Felix’s decline is spectacularly etched by Hickey right up to the final moving moments of the play, his voice now a hoarse whisper. Ellen Barkin is the wheelchair-bound Dr. Emma Brookner, sardonic, no-nonsense, and compassionate, desperate to warn the gay community that their sexual liberation might be killing them. Her second act monologue as she rails against the board denying her needed research funds is one of the most searing scenes on the boards right now, truly goose-bump time. Ned’s colleagues in the Gay Men’s Health Crisis (though it's never named) – Mickey Marcus (Patrick Breen), Bruce Niles (Lee Pace), Tommy Boatwright (Jim Parsons) among them – are all pitch-perfect, and Kramer has constructed the play so that each gets his own chance to shine. One by one, we observe the toll that the struggle is taking on each one of them. Mark Harelik as Ned’s straight brother from whom he becomes estranged, and Richard Topol is the mayor’s assistant are spot-on in their roles, too. The direction is taut, as in the tense scene of the group’s meeting at a windowless basement office at City Hall, but there are many moments when you can hear the proverbial pin drop. Far more than a polemic, this is a blazingly vital drama that will, I think, stand the test of time. The audience responded at the end with a richly earned standing ovation. There have been many worthy dramas on Broadway this season, but the sense of urgency in this one is unmatchable. Curiously, John Guare’s absurdist comedy seems to have dated less well than many of the other plays revived this season, though that being said, there is plenty to enjoy here, and David Cromer’s production is very fine, if rather darker (literally, thanks to designer Brian Macdevitt’s low-keyed lighting, and figuratively) than the Vivian Beaumont revival of 1986. Saddled with a schizophrenic wife, aptly named Bananas (Edie Falco), he plans to commit her to an institution and run off with his mistress, downstairs neighbor Bunny Flingis (Jennifer Jason Leigh). His boyhood friend Billy (Thomas Sadoski), now a Hollywood bigwig, would seem to be his salvation, and Bunny urges him to call, and pave the way for a visit. The aforementioned bar lounge excepting, the action takes place in Artie’s cluttered apartment in 1965 (set by Scott Pask), the day of Pope Paul VI’s visit, giving Guare plenty of opportunity for satiric jibes about religion and the nature of celebrity, both of which coalesce in the sudden appearance of three idolatrous nuns – Mary Beth Hurt, Susan Bennett and Halley Feifer – who are so enamored of the Pope that they come through Artie’s window begging to watch their beloved Pontiff on television. Stiller makes a good Artie, and demonstrates a natural stage presence. But it’s hard to feel sympathy for his character and his failed dreams, as his behavior to Bananas seems so callous. Falco is extraordinarily good and very touching as the sometimes surprisingly perceptive missus. And Leigh’s self-centered Bunny hits all the comic notes as she utters one vapidity after another. Alison Pill – so fine in last year’s underrated production of “The Miracle Worker” – is marvelous as Billy’s glamorous blonde girlfriend who decides to pay a visit to the Shaughnessys with funny and ultimately tragic results. Sadoski makes his appearance late in the play, and is another plus. 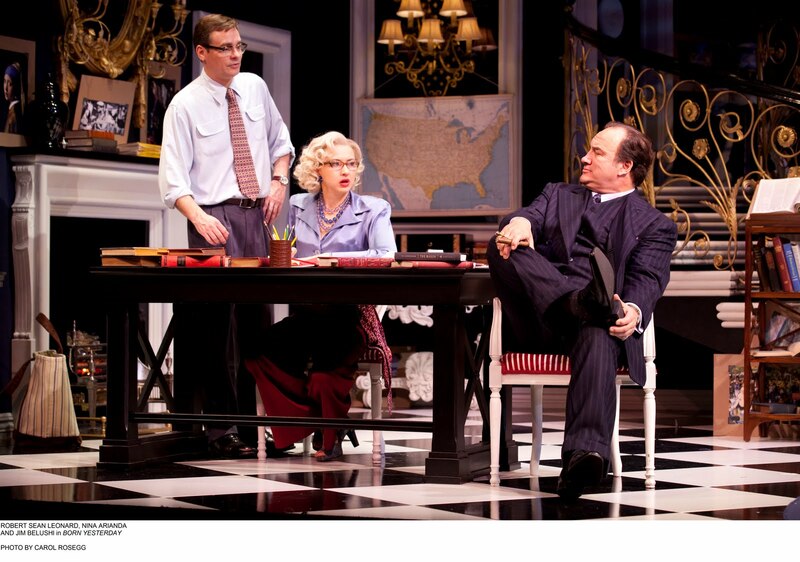 Garson Kanin’s 1946 comedy holds up very well indeed in Doug Hughes’ solid revival, featuring, as it does, three sterling leads: Jim Belushi, Robert Sean Leonard, and, in her Broadway debut, Nina Arianda. 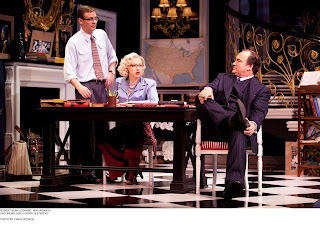 The story, set in Washington, D.C., centers on Billie Dawn, a stereotypical “dumb blonde” (Arianda) whose thuggish, junk magnate lover Harry Brock (Belushi) hires New Republic reporter Paul Verrall to give her some gentility. Inevitably, she falls in love with Verrall in the process. The George Cukor film version with its indelible original stage star Judy Holliday at her most adorable is, of course, a staple of Turner Classic Movies. The sweetness and innate class of Holliday’s performance is somewhat lacking in the otherwise marvelous Arianda’s winning performance which, rather than because any lack of chemistry between Arianda and Leonard, serves to undercut the believability of romance between Billie and Verrall. Would this bookish, articulate crusader really fall for someone quite so common? Then again, there’s Henry Higgins and Eliza Doolittle, but I digress. But even if disbelief must be suspended rather more than usual, the play delivers the requisite laughs. And the premise that a little education can lead to empowerment, a greater sense of civic responsibility, and ultimately defeat high-powered corruption in our nation’s capital, still resonates, however simplistic that last notion may be. Bulushi gives a well shaded performance showing the vulnerability beneath the Tony Soprano-like exterior, so much so, in fact, that you genuinely feel sorry for him as Billie starts to gravitate towards Verrall. And this is even after we have witnessed Brock’s extreme physical brutality towards Billie when she first stands up to him. Terry Beaver as the senator under Brock’s thumb, and Frank Wood as Brock’s once-upright lawyer, and Michael McGrath as one of Brock’s henchmen, give good support. John Lee Beatty’s ostentatiously ritzy hotel suite, provides a sleek playing area for all three acts. Interesting footnote: in a season in which “Anything Goes” has returned in such a triumphant revival, “Born Yesterday” is one of two straight plays currently on the boards that quotes one of the Cole Porter musical's songs. On this occasion, he’s societal renegade Johnny “Rooster” Byron, living in a ramshackle trailer home in a Wiltshire forest of present-day England. It’s St. George’s Day, and the provincial Flintock Fair is in full swing. But Johnny’s on the outskirts, surrounded by the young people to whom he supplies drugs and liquor, and yet, paradoxically, serves as protector. These include DJ-wannabe Ginger (superb Mackenzie Crook), soon-to-emigrate to Australia Lee (John Gallagher, Jr.), chubby slaughterhouse worker Davey (Danny Kirrane), two randy girls, Pea (Molly Ranson), and Tanya (Charlotte Mills), and runaway Phaedra (Aimee-Ffion Edwards). There’s also a dotty professor (Alan David) and a sad-sack bartender (Max Baker) who has banned Johnny from his pub, after the latter recently went on a naked bender (the incident repeatedly and amusingly referred to as a “fracas”). Of course, Johnny has no memory of this, nor of the wild revels the night before when, among other things, he smashed his flat-screen TV. The local authorities are poised to evict him, but you’d almost never know it from Johnny’s nonchalance. But as the story progresses, and Johnny is visited by his six-year-old son Marky (Aiden Eyrick at my performance), in tandem with the boy’s mother Dawn (Geraldine Hughes), playwright Jez Butterworth peels back the bravado from the former daredevil cyclist (20 years earlie), and we see – thanks to Rylance’s monumental performance -- the humanity beneath. His absolutely mesmerizing recounting of a tall tale about a long-ago encounter with a giant is but one example of Rylance's formidable technical skill. He’s funny in his often deadpan delivery, but also poignant in his self-awareness. It’s a long play, with only a pause between the second and third acts, but it holds your interest, despite the occasional talky patch. Though some of the cultural references may be obscure to an American audience, the overarching theme of England’s eroding rural life, its ironic title taken from the Hubert Parry/William Blake anthem (sung in the play by Phaedra, dressed in her fairy costume for the fair), is easy enough to follow. And Butterworth’s dialogue is wonderfully quirky. Under director Ian Rickson, all of the performances – both the original Royal Court cast from London, and the few American replacements – are terrific, their characters richly drawn. Both the play and Rylance’s performance make this a must-see experience. This thoroughly entertaining stage version of the 1992 Whoopi Goldberg movie about a singer who goes undercover in a convent after she witnesses her crooked married boyfriend commit murder – in the process, reinvigorating the choir, the church, and the community -- is the latest in a series of film-to-stage adaptations this season. More so than “Women on the Verge of a Nervous Breakdown” or “Catch Me If You Can,” “Sister Act” most resembles “Priscilla, Queen of the Desert” both in its musical milieu, although this is a brand new score (by Alan Menken), and its drag sensibility. 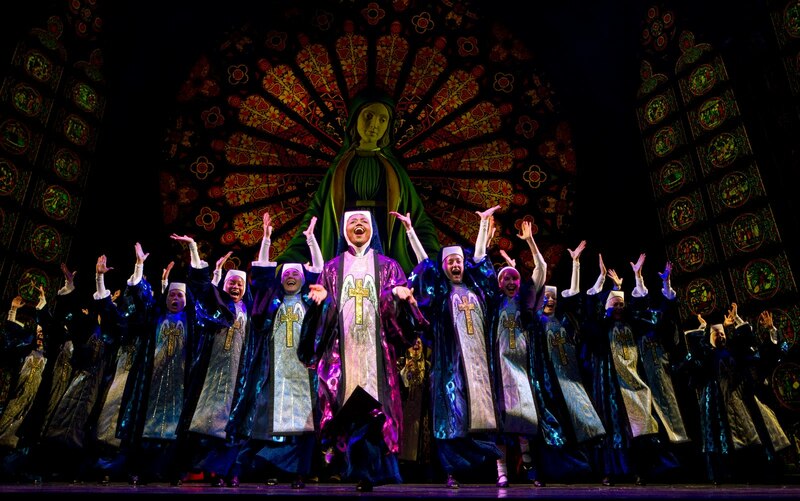 For here we have, after all, a bevy of nuns ultimately jazzing up their habits with sequins and glitz. 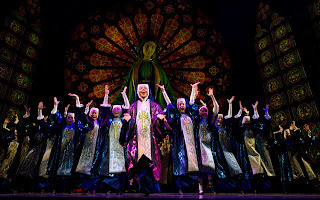 Both shows are enjoyable, but I’d give “Sister Act” the edge for its overall cohesiveness. A sort of Tina Turner with a heart of gold underneath the cocky exterior, Deloris takes the pathetically off-key sisters’ choir and gets them singing the Lord’s praises with Motown-fused ardor. The number that effects that transformation, “Raise Your Voice” is a real showstopper. The other principal nuns are excellent and distinctive, too: Marla Mindelle as the shy postulant Mary Robert who finally cuts loose with her eleven o’clock number “The Life I Never Led”; Sarah Bolt as the jolly Mary Patrick; and Audrie Neenan as the feisty Mary Lazurus. The reliable Fred Applegate is spot-on as Monsignor O’Hara who overrules Mother Superior’s worries about appropriateness of Deloris’ methods, particularly when attendance in the failing parish starts to climb, the collection baskets to fill, and no less than Pope Paul VI sends word he wants to see the sisters in action. John Treacy Egan, Caesar Samayoa, and Edmond Green are a hoot as the henchmen of bad guy Curtis (Kingsley Leggs) who join him for the comically threatening “When I Find My Baby,” as Curtis declares what he’ll do to Deloris when he locates her, and in the second act vocalize, one by one, their absurdly romantic notions of how they’ll apprehend Deloris by sweet-talking the nuns (“Lady in the Long Black Dress”). Chester Gregory as Eddie, the cop assigned to protect Deloris, and who’s loved her since high school, shines in his brightest number when he imagines the kind of cool dude he might be if he overcame his shyness (“I Could Be That Guy”). Menken’s score (clever lyrics by Glenn Slater) has the appropriate soul-infused sound, but includes more reflective numbers where required. And the well-constructed book by Cheri Steinkellner and Bill Steinkellner (adapted from Joseph Howard’s screenplay) has lots of laughs, no doubt many of them the work of Douglas Carter Beane who supplied “additional book material." Jerry Zaks is an old hand at this kind of funny business, so the comedy is given full measure, while the narrative clips along at a tight pace. Anthony Van Laast provides the sister’s roof-raising choreography. Klara Zieglerova has designed an imposing church setting for most of the action, with Natasha Katz supplying appropriately subdued lighting for the intimate scenes and ramping it up for the flashy production numbers. 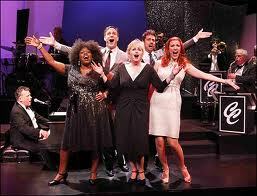 The audience responded with rousing enthusiasm throughout, affirming the show’s sure-to-be hit credentials. “The People in the Picture” is the sort of show that makes you wonder how so many extremely talented people could come up with such a ho-hum result. Donna Murphy plays Bubbie, an old Jewish grandmother living with her resentful, single-mom daughter Red (Nicole Parker) and grandchild Jenny (Rachel Resheff) in 1977 New York. Jenny, if not Red, adores Bubbie who, we learn, was once the star of a Yiddish theatrical troupe in Warsaw in the 1930’s, when her name was Raisel. Jenny can’t get enough of her grandma’s colorful past, and is eager to soak up the language, culture and culinary delights of the old country. "Beaches"-author Iris Rainer Dart’s script moves back and forth in time, as Raisel’s history unfolds. Bubbie’s lover goes off to America, leaving her pregnant. As anti-Semitism escalates, the members of the troupe are increasingly harassed, Bubbie is compelled to take drastic action to protect her child. And we eventually learn what precisely Red has against her mother. The music – the songs credited to either Mike Stoller (of Leiber & Stoller) or Artie Butler respectively – is unobjectionable, but on first hearing, not terribly distinguished, and reminiscent of other, better, Jewish-themed musicals. Ms. Dart’s lyrics are dully predictably. You can hear the rhymes coming a mile away. 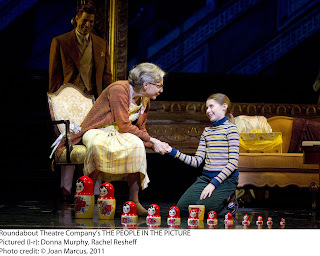 Murphy gives a truly superb dramatic performance, effortlessly transforming from the increasingly forgetful old lady to the vibrant young performer. But the property is so unremarkable, it’s difficult to enthuse about her considerable accomplishment. I would much rather see her in, say, “Rags.” Her colleagues in the troupe are all fine performers – Alexander Gemignani, Joyce Van Patten, Chip Zien, Lewis J. Stadlen, Christopher Innvar – so no complaints there either. Riccardo Hernandez’s setting – a giant picture frame and other smaller frames – is obvious but striking, at least for a while. Ann Hould-Ward’s costumes seem accurate enough for the period, and allow Murphy to change eras smoothly. Michael Starobin’s accomplished orchestrations, conducted with customary flair by Paul Gemignani, are as polished as the rest of the production. There’s not much choreography to speak of, but Andy Blankenbuehler is credited with musical staging. Leonard Foglia directs competently, but the whole enterprise is so by-the-numbers, with one clichéd moment following another, that it seems all for naught. Though the press material for the show speaks of it being "funny," the attempts at humor are actually fairly lame, and with its heavy Holocaust theme, I'd say “Mildred Pierce” meets “The Dybbuk” is more like it. But Murphy is remarkable.